With over 30 acres of machinery, we are a tractor salvage operation that supplies used parts for all makes of antique and late model farm tractors. Used Tractor Parts (Grandview) Ltd. has been helping farmers keep their tractors turnin' dirt since 1985 and is located in Grandview, Manitoba, Canada. 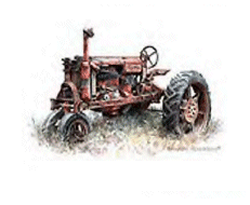 Looking for used farm tractor parts? You can browse our listing of tractors we are parting out. Or you can go directly to our ﻿request form﻿. Please be sure to include make and model of the tractor. If you have your part #, that will help us even more. If you have been searching for a a specific tractor (and do not see it listed on our website), shoot us an email at utpmanitoba@gmail.com or give us a call at (204) 546-3103. We are finding tractors all the time! UTP Used Tractor Parts (Grandview) Ltd.